by Hill, John W.; McCreary, Terry W.
NOTE: You are purchasing a standalone product; Mastering Chemistry does not come packaged with this content. If you would like to purchase both the physical text and Mastering Chemistry search for ISBN-10: 0321971183 /ISBN-13: 9780321971180. That package includes ISBN-10: 0133901483/ISBN-13: 9780133901481 and ISBN-10: 0321972023/ISBN-13: 9780321972026. For non-majors introductory chemistry courses. Chemistry for Changing Times has defined the liberal arts chemistry course and remains the most visually appealing and readable introduction to the subject. The 14th Edition increases its focus on environmental and other relatable issues with revised green chemistry essays throughout and new Chemistry at Home experiments, both in the text and in Mastering™ Chemistry. Abundant applications and examples fill each chapter and enable students of varied majors to relate to the content more readily. Updated material throughout reflects the latest scientific developments in the field demonstrating the relevance of chemistry to all students. Mastering Chemistry from Pearson is the leading online homework, tutorial, and assessment system, designed to improve results by engaging students before, during, and after class with powerful content. Instructors ensure students arrive ready to learn by assigning educationally effective content before class, and encourage critical thinking and retention with in-class resources such as Learning Catalytics. Students can further master concepts after class through traditional and adaptive homework assignments that provide hints and answer-specific feedback. The Mastering gradebook records scores for all automatically graded assignments in one place, while diagnostic tools give instructors access to rich data to assess student understanding and misconceptions. 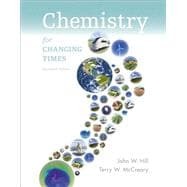 Chemistry for Changing Times, 14th Edition is also available via Pearson eText, a simple-to-use, mobile, personalized reading experience that lets instructors connect with and motivate students — right in their eTextbook. Learn more.